Vegetable oils provide a number of nutrients the body needs, including essential fats and vitamins. They also offer a wide variety of ways to flavor your food while boosting its nutrient content. You might add olive oil to soups and casseroles, saute vegetables in canola or sunflower oil and drizzle flax, sesame or wheat germ oil over salads, granola or yogurt. Many vegetable oils contain primarily polyunsaturated and monounsaturated fats. These fats are healthier for your heart than saturated fats. Among the vegetable oils containing polyunsaturated fats are safflower, corn, sunflower, soy and cottonseed oils. Some oils with monounsaturated fat are olive oil, certain seed oils like canola and sesame and nut oils like peanut oil. Coconut and other tropical oils, however, contain primarily saturated fat. Trans fats, which include partially hydrogenated vegetable oils, wreak havoc on your health and should be avoided. Essential fatty acids are nutrients necessary for health, but that the body can't make and must get from food. The two primary types are omega-3 and omega-6 fatty acids. Linoleic acid, an omega-6 fat, is found in flax, sesame, sunflower, safflower and soybean oils, notes John McDougall, M.D., at his website. Flax, soybean and canola oils contain alpha linolenic, a type of omega-3 fatty acid similar to the fatty acid in fish oils. Vegetable oils are some of the richest sources of vitamin E. This vitamin is an antioxidant that protects cells from free radicals that could damage them. Among the vegetable oils high in vitamin E are wheat germ, sunflower, cottonseed, almond and safflower oils. Wheat germ oil provides over 20 milligrams of vitamin E per tablespoon, 135 percent of the daily requirement, according to nutrition experts from Ohio State University. Sunflower oil contains 6.1 milligrams per tablespoon, while 1 tablespoon of olive oil offers 1.6 milligrams vitamin E.
Olive oil, which figures prominently in the traditional Mediterranean diet, may lower LDL cholesterol and risk of heart disease. Although coconut oil is high in saturated fat, proponents suggest it may have health benefits. This is due to findings that Pacific Islanders eating their traditional diet, which is rich in coconut oil, have lower rates of heart disease and some other conditions, write experts from the University of Michigan. The ALAs in flax oil may also have cardioprotective properties. While most common vegetable oils are useful for cooking and flavoring food, oils with reputed health benefits also have dosage guidelines. If you take flax oil for its ALA content, you'll need 1 to 2 tablespoons daily, advise University of Maryland experts. 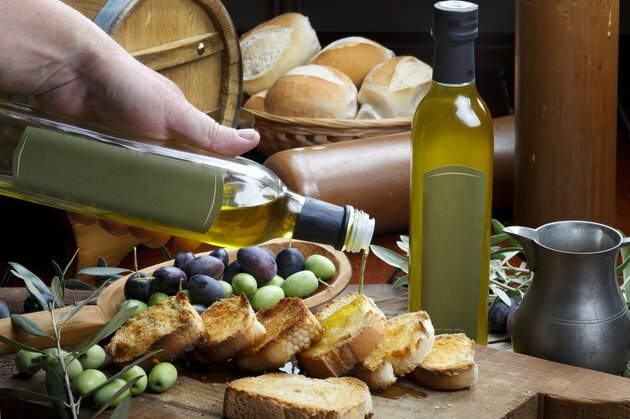 For cardiovascular benefits, the FDA recommends 2 tablespoons of olive oil daily. Pacific Islanders' traditional diets provide at least 1 tablespoon of coconut oil a day. Vegetable oils, like all fats, contain 120 calories per tablespoon, so if you're watching your calorie intake, use vegetable oils sparingly. Consult a health care provider before taking any vegetable oil for specific health benefits. University of Illinois: What are Polyunsaturated and Monounsaturated Fats? DrMcDougall.com: When Friends Ask: Why Do You Avoid Adding Vegetable Oils?